Shah Rukh Khan to groove with HOT Sunny Leone in 'Raees'! Here we have a very sizzling news... It might be one of the most hot and happening casting coup of sorts. Buzz is out that Shah Rukh Khan and hottie Sunny Leone will share the screen space for the very first time in the much awaited film 'Raees'. We were told that the two will shake a leg to the 1980 chartbuster "Laila O Laila", from the movie 'Qurbani' which featured Feroz Khan and Zeenat Aman. Talks are that Sunny's face off with a journalist on a talk show, won her lot of praises. And if one notices, only good things have followed her since then. Everyone from Aamir Khan and Anushka Sharma to Varun Dhawan and Alia Bhatt taking up for the actress. Now the news is that, Sunny will be shaking a leg with Shah Rukh Khan in Rahul Dholakia's crime-drama upcoming 'Raees'. It is said that Producer duo Ritesh Sidhwani and Farhan Akhtar, who are fans of the classic number, acquired the rights to Amit Kumar-Kanchan song which is being re-recorded and rendered with faster beats. Revealed a source, "Raees is set in the '80s and there was need of a song sequence. The makers unanimously selected "Laila O Laila" which perfectly fits with the dark, gangster theme and period. It was suggested to Shah Rukh and it was his idea to get Sunny on board. A lavish set is being created in Mumbai and rehearsals are on in full swing,"
Mahira Khan, a Pakistani actress, will be playing Shah Rukh's Lady Love. Amitabh Bachchan: My Granddaughter Navya Nanda is not on Twitter! 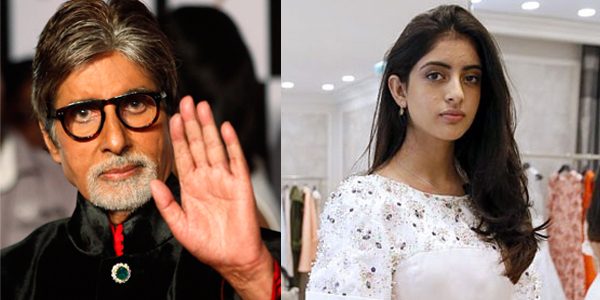 Iconic star Amitabh Bachchan recently took to twitter and expressed his anger to public that his granddaughter Navya Naveli Nanda is in news all the time. And the reason behind it is through social sites, he took to Twitter and said that Navya is not on Twitter and the account made on her name is fake. Amitabh did not just warn everyone against Navya's fake account on Twitter but also alarmed that it is a fake account. He wrote, "ALARM : my grand daughter Navya Nanda is not on Twitter .. that account is fake ..!! I responded to it by mistake .. BE WARNED !!" This star kid Navya has always been in headlines for her pictures going viral on social media. She was also a part of the famous Paris Debutante Ball last year, where she looked like a princess and won hearts all over. She is currently studying in London with Shah Rukh Khan's son Aryan Khan.